Kids R Kids, Builds First National LEED Certified Facility with Enlisted Proven Results by Two Trails Green Consulting. The Kids R Kids LEED certified building is located in Lithia, FL & a part of the Newland Communities FishHawk Development. The facility is a 12,500 s.f. building that serves as a learning academy for children ages 6 months to 12 years of age. 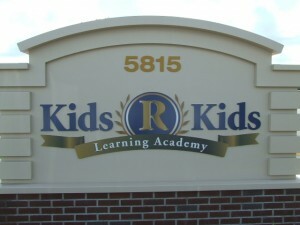 Kids R Kids learning academies are located in 15 states throughout the United States; this is their first facility to achieve a LEED certification. The building received a LEED Certified designation, under the USGBC (United States Green Building Council). The LEED Green Building Rating System is a 3rd Party certification program that evaluates the environmental performance of the building and provides a validation of compliance. It is broken down into five categories: Sustainable Sites, Water Efficiency, Energy & Atmosphere, Materials & Resources, and Indoor Environmental Quality. Many companies are starting to see the benefits of building to a higher standard. Two Trails applauds Kids R Kids for building to a green standard knowing that it is good for the environment, but more importantly for the occupants that matter most, the children. While all categories of the LEED designation are important the Indoor Environmental Quality is important to the quality of work life for the staff as well as the children. Research has been done over the past several decades regarding the negative impacts of poor indoor air quality on occupant health and productivity. Considering the amount of time Americans typically spend indoors, taking steps to ensure a healthy indoor environment is imperative. Most indoor environmental quality problems are preventable through thoughtful design and construction practices. Volatile Organic Compounds (VOC's) are one of the primary sources of indoor air contamination. Commonly associated with respiratory irritation and illness, these chemicals are released into the air by materials installed inside the building envelope. The LEED rating system specifies maximum VOC limits for the most notorious offenders: adhesives, sealants, paints, carpeting, and composite wood products (casework and furniture). Special care was taken during construction to ensure that finish materials and HVAC systems were properly protected from construction contaminants. An Indoor Air Quality Management Plan was developed, and implemented during the construction and pre-occupancy phases of the building, based on the Sheet Metal and Air Conditioning Contractors National Association (SMACNA) Indoor Air Quality Guidelines for Occupied Buildings under Construction. All absorptive materials, both stored onsite and installed, were properly protected from moisture damage. All ductwork was sealed immediately upon installation, and permanently installed HVAC units were not operated during construction. Other factors influencing the well being of the building occupants are controllability and views. The building design provides a high level of lighting and thermal comfort control to staff/teachers. This allows them to make adjustments to suit the group needs. The building was designed to maximize the views through the building, with views from 97% of occupied spaces. “Two Trails is proud to have worked on this project. Changing the future and putting the occupants of Kids R Kids facility first is something that everyone can feel good to be a part of this project. It is my sincere hope that more facilities that house our youth will follow Kids R Kids lead in building to a green standard.” Stated Drew Smith President of Two Trails. Newer PostSynergy Building Corp. builds the Largest LEED Platinum Home in Sarasota County verified by Two Trails Green Building Consulting.